If you’ve been on the hunt for the best dog toy to get your energetic pup, look no further, because we’ve found it for you. The Hide-A-Squirrel Puzzle is one of the most gifted dog toys on Amazon — and with good reason, too. Not only is it the best kind of toy to keep your dog occupied and entertained, it also provides mental enrichment. 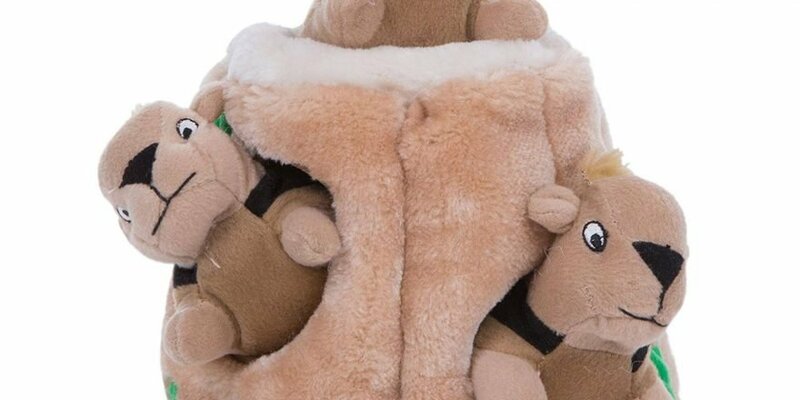 The plush puzzle toy features a tree trunk filled with squeaky stuffed squirrels, meant for your pup to sniff around and hunt for. But it also doubles as a game of fetch — the squirrels are removable, so you can toss them around after your dog has figured out the puzzle. Plus, it doesn’t hurt that this toy has over 10,000 reviews and an overall total of 4.3 stars on Amazon. Customers love Hide-A-Squirrel for both puppies and older dogs alike, and many say their dogs became more obsessed with this puzzle than any other toy. “We got this Jumbo squirrel log as a distraction for our German Shepherd — we give it to her as we leave the house, but she also pulls it out of her toy bin when we’re home. She loves it — it’s definitely her favorite toy of all time,” one reviewer wrote. Hide-A-Squirrel comes in different sizes to accommodate your pup, varying from small to extra large, and you can also choose different styles, including a bee puzzle, bird puzzle, and hedgehog puzzle — and they’re all extremely cute.